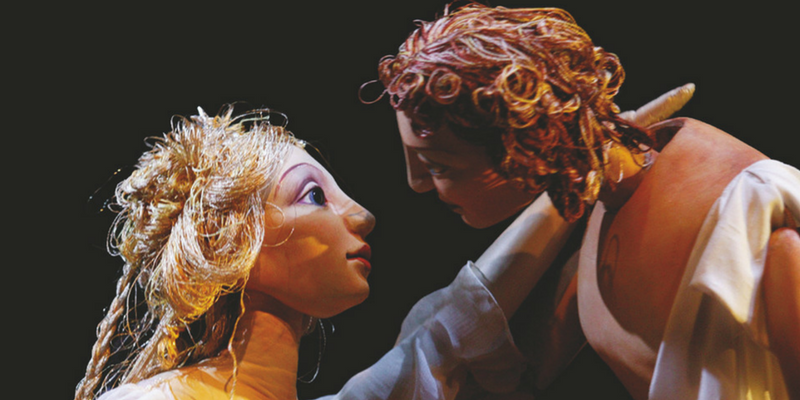 Venus and Adonis – Civic Theatre – Dublin Theatre Festival – Review by Frank L.
Little Angel Theatre is a theatre company devoted to the art of puppetry. In 2004, director Gregory Doran explored the possibility of dramatising, with puppets, Shakespeare’s long narrative poem Venus and Adonis written in 1593. This resulted in a remarkable collaboration between the puppet makers at the Royal Shakespeare Company and Little Angel Theatre. The stage consists of the recreation, in miniature, of a proscenium arch theatre with curtains, gilding and all the other traditional trappings of such a theatre. In front of it stands a great solid table whose height is just below that of the floor of the miniature stage. There is a chair situated on each side of this table. The performance begins with guitarist Simon Davies and narrator Suzanne Burden taking their respective place in each chair. At the same time the curtains of the miniature theatre open and the performance begins. While some action takes place on the stage with marionette puppets, the principal action takes place on the table with hand held puppets. Here the five black clad puppeteers (Louisa Ashton, Ailsa Dalling, Edie Edmundson, Rachel Leonard and Stan Middleton) breathe life into the puppets, particularly Venus and Adonis. They are so successful in this task that the amorous scenes between Adonis and Venus bring gasps of nervous laughter and delight from the audience. The puppeteers, whose presence becomes entirely secondary to that of the puppets, make them move, particularly very small movements of hand or foot, in such a skilful manner that insights are brought to Shakespeare’s words. The quality of narration by Suzanne Bardon is sublime and her phrasing and intonation is in harmony with the text. Meanwhile Simon Davies’s guitar accompaniment, which includes a solo interlude, complements the entire ambience of the piece. One of the fun parts of using puppets on stage is that they can perform feats which it would not be possible to entertain with real creatures. Some of the movements of Venus and Adonis are within the physical capabilities of humans and some are quite far removed. In addition, it is impossible to envision real horses or a wild boar cavorting across a stage but this is all possible thanks to the skill of the puppet makers and the puppeteers. Gregory Doran has created a magical piece of theatre which lasts for approximately an hour. During that time, the audience is brought to another world. It permits the imagination to go into overdrive. It transports the viewer to another place far away from the mundane. It is a place where those eternal human conundrums of Love and Death hold court. It is a privilege to be in such a place. Duration: 60 mins. No interval.